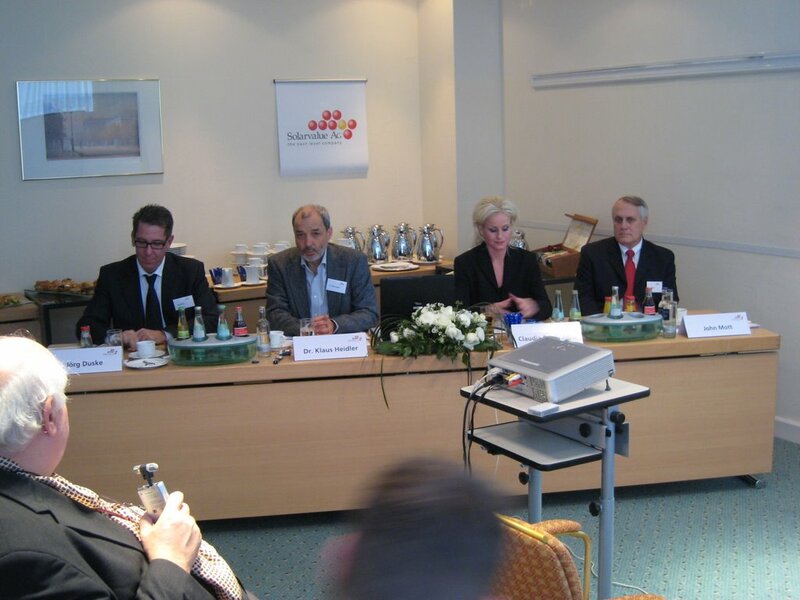 Last week on November 17, 2006, Solarvalue AG (XETRA:SV7) (http://www.solarvalue.com) held a coming out press conference coincident with the 7. Forum Solarpraxis in Berlin, Germany. Of the three open areas I wanted to learn more about (see previous post), Solarvalue addressed one in detail disclosing their near term plans, solar grade silicon production process, and strategy. Solarvalue elaborated on their relationship with joint venture partner W&P Profil d.o.o. Although W&P Profil will own 51% and Solarvalue Production d.d. 49% of TDR – Metalurgija, Solarvalue Production d.d. will be a separate legal entity with dedicated management and independent decision control regarding solar grade silicon production. 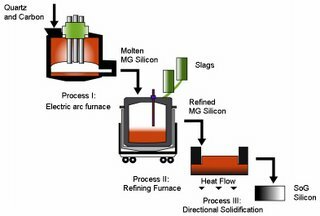 “We will begin by setting up the 12 MW M5 arc furnace for silicon production. At temperatures of 2,200 °C, the furnace is used for the reduction of high-purity quartz with high-purity carbon to produce metallurgical silicon of 99.9+% purity.” said John Mott, Chief Operating Officer of Solarvalue Production d.d. This will be Process I of the enhanced Solarvalue Method. In Process II, several refining steps involve re-melting silicon in induction furnaces, and directional solidification to remove heavy metals and most of the phosphorus. Special slags are added to bind other impurities including boron, carbon, and oxygen. Process III uses a special temperature profile during directional solidification to further reduce the impurity levels of boron and phosphorus to achieve high-quality solar grade silicon. Solarvalue expects the first solar grade silicon (SGS) to be available in the spring 2007 and plans to produce 850 metric tons of solar grade silicon by year end 2007. Expected production capacity in 2008 is 4,400 metric tons of solar grade silicon. In terms of material, 12.5 metric tons of quartz will be needed to yield one (1) metric ton of solar grade silicon. Solarvalue claims the Solarvalue Method will enable solar grade silicon to be produced at half the cost of polysilicon from the industry standard Siemens process. Here is a video bite (on YouTube) with John Mott answering a question about why the Solarvalue Method is cheaper than the Siemens process. “In the first six months, strategic investors will provide €20 million for setting up the production of solar grade silicon,” said Strategy Advisor Joerg Duske. One strategic investor from India has a technology expertise focus, while the second strategic investor from Europe is obtaining a stake in the TDR Ruse plant to secure silicon for solar cell production. An additional €10 million investment will be required in 2008 to complete the 4,400 metric ton capacity ramp. Later, Solarvalue may forward integrate ingot and wafer production from solar grade silicon at the TDR facility in Ruse, Slovenia. 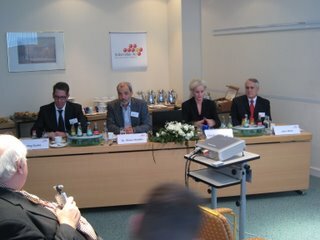 You can read the Solarvalue Press Conference release on the DGAP ad hoc service (English, Deutsch). Although there are other possibilities, could the strategic investor from India be Moser Baer India Limited (BOM:517140)? why do you thing that Moser Baer India Limited is one of the investors in solarvalue? Can you tell me? Moser Baer is investing like mad in diverse solar technologies including SolFocus, Solaria, and Stion. Moser Baer Photo Voltaic (MBPV) is building an 80 MW silicon solar cell line (Phase I) and needs silicon.